This summer Seth decided he wanted to participate on swim team. Our neighborhood has their own team and since we also have a neighborhood school, pretty much everyone on Seth’s team also goes to his school. He was so excited to show up on the first day of practice and immediately recognize almost everyone in his age group. Another huge reason why I LOVE LOVE our neighborhood! Seth was only able to attend 2 practices before we headed out of town for our family vacation (post to come later on that). 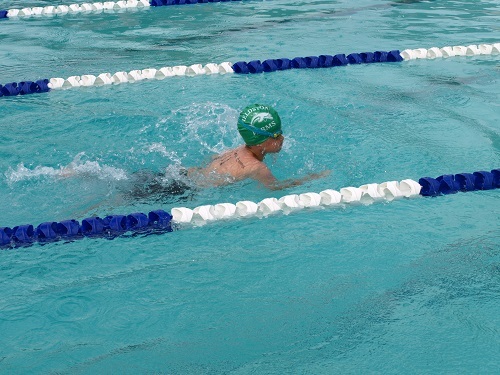 His first meet was the Monday after vacation so he hadn’t practiced in over a week. I could tell he was very nervous. I usually don’t worry about Seth being anxious or nervous about much of anything (can’t say that about all my kids) but he was most definitely nervous on our drive to the pool. Then he showed up at the pool and I became very nervous as well. THANK GOODNESS I had hired a babysitter for my 2 younger kids because the meet was crazy. We were supposed to locate our child on the heat sheets and then record every race they were a part of (including event number, heat number, and lane number). I then had to write all of that information on Seth’s back in a sharpie. Each swim team had over 100 kids there so just imagine all the kids, siblings, and parents doing this for their child. It was nuts! I just put Carter in a chair with his book and tried to help Seth calm down and feel comfortable. I didn’t do a very good job. There were kids crying everywhere. I SO did not expect this at all. Sometime in the midst of all of this, I texted Zach and told him I was convinced more than ever that we were a baseball family. I couldn’t handle this stress! By the time it was Seth’s turn and I got him up to the edge of the pool, he finally gave into the tears and started crying that he was so scared. It broke my heart. Again, this is so unexpected from him. However, he never asked to quit. He never backed down and I was SO proud of him for that. 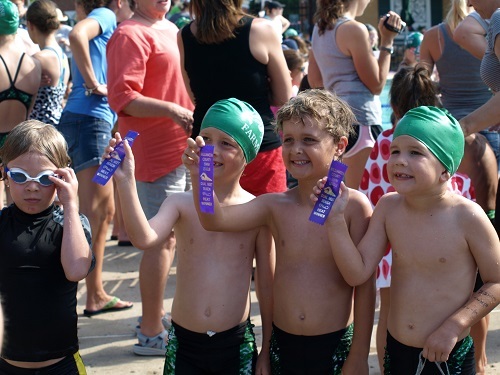 There were plenty of kids that didn’t get in that pool for their first race. I told Seth he just had to make it down the pool no matter how he did it…doggy paddle, hold onto the rope, or swim. And he did! He didn’t finish first but he didn’t finish last either. He struggled again with his second race. 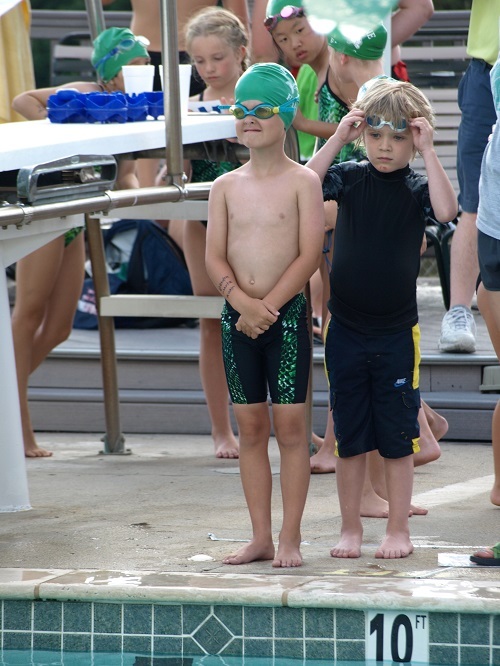 But for some reason, he was calm before his third race – a freestyle relay. 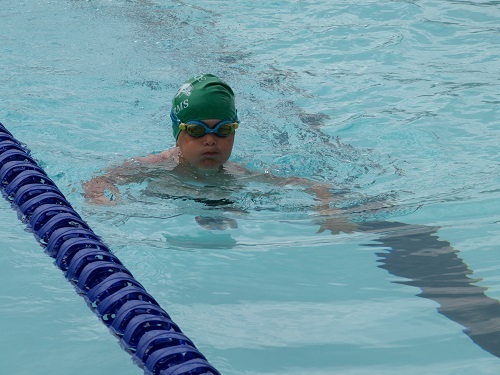 He actually swam the length of the pool without reaching for the rope! I was so proud of him! And his team finished first!! He was THRILLED! I am hopeful that the stress and emotions of this first meet will be gone by the time we get to the next meet. 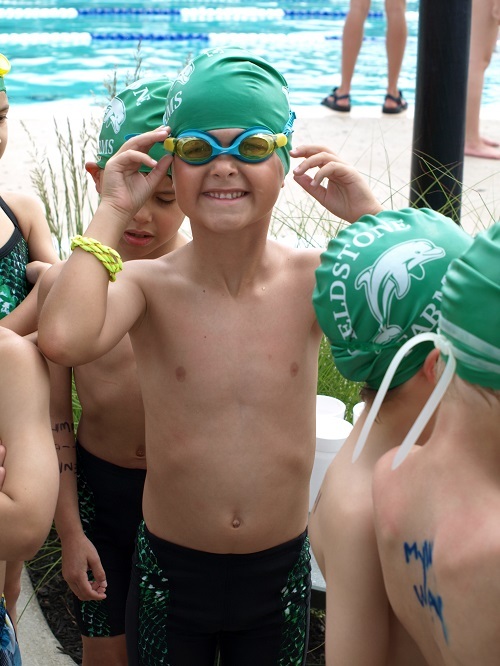 His confidence has soared with his relay win, so I think he will have an easier time next time. I told him so many times that I was proud of him for not quitting when he was scared. It was a great lesson in perseverance. Despite the rough start, at the end of the day we both said it was fun! 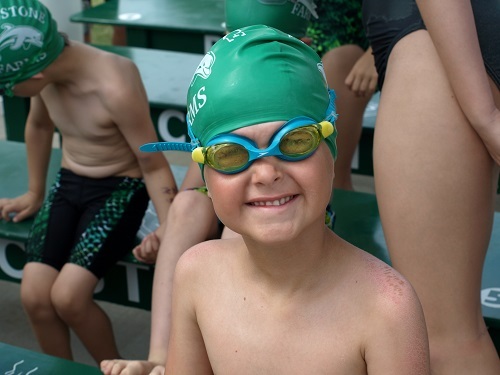 All smiles before he had to line up to swim. 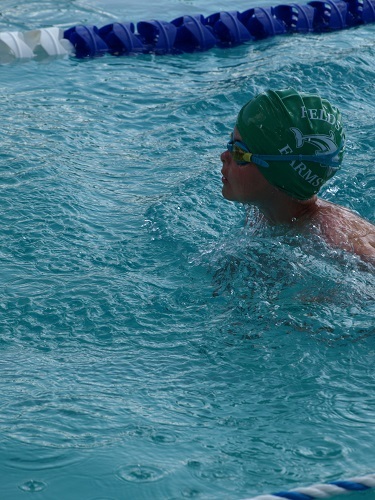 His first swim – freestyle. Ready for his relay. I do think part of what really scared him was the fact that he had to jump into 10 feet of water. He has never swam in 10 feet. Yeah, well after reading this post I can go ahead and cross out “swim on swim team” off my to-do list for the kids! 🙂 Reading this stressed me out and poor Seth and poor you! Go Seth, though! That is a fantastic lesson in perseverence!